Echo Park catcher Manuel Guillama had a good game in a losing cause. His team fell, 5-4, to Oakland at Oakland Coliseum. Guillama went 2 for 4 with 2 home runs and a walk. Júlio Rodríguez recorded the save for Oakland, his 2nd of the season. The first-place Oaks have a one-game lead in their division. Luis Luquín was 1-3 with a double and was hit by a pitch for Oakland. The 29-year old shortstop had a key at-bat in the bottom of the eighth. 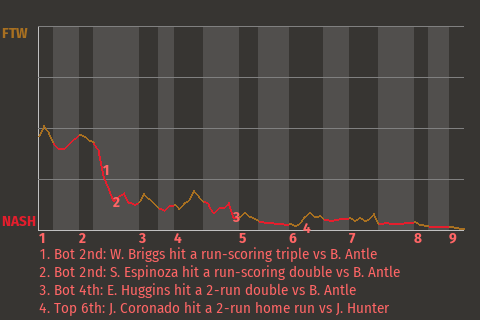 With two out and the bases loaded, he broke a 3-3 tie with a run-scoring hit-by-pitch off Will Hunting. It was his 4th RBI of the season. "I still think this team has room for improvement," Luquín told the Oakland Bulletin. Special Notes: CF Armando Rodríguez was injured being hit by a pitch.